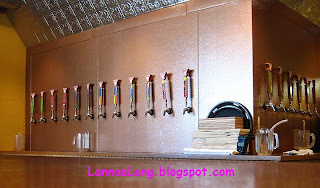 The Yazoo Brewery is now open in its new location! Mega number of taps, tons of of table space, tons of beer rail space along the wall, a nice patio space, and plenty of street parking around the block. There are also multiple stall modern bathrooms, probably a good thing when people are drinking beer. All involved did a great job with the look and feel of this place, and I really like it. Same hours, Thursday and Friday 4 - 8 pm, Saturday 2 - 8 pm, and growlers only on Wednesday 4 -6 pm. When arrangements were being made for my Aunt Mary's memorial, her kids wanted to have an event on Aunt Mary's birthday to celebrate her nearly 100 years of life in the solar calendar (over 100 yrs of life in the Chinese lunar calendar), rather than harp on her death. I was instructed to wear festive colors, black would be acceptable if I usually wore black. This was going to be a fun, funny, food filled affair just as if Aunt Mary was throwing the party herself. So, going against all formalities such as wearing somber black or navy, I wore a red dress to this celebrate my Aunt Mary's life. Also there is a thing about Chinese people when it comes to events, they know how to throw a food festival! Yes indeed, there is nothing like a Chinese Banquet. Many cultures events and celebrations revolve around food, as well as the Chinese. When there are guests involved, most Chinese hosts pull out all the stops and serve up the best foods they have for their guest. The memorial 10 course dinner banquet to remember my Aunt Mary was certainly following the traditions of fabulous and fabulously expensive banquet dishes. The arrangers for Aunt Mary's memorial banquet opted for the Hong Kong Lounge in the Richmond District of San Francisco. This restaurant was close by to Aunt Mary's apartment, and is in "the New Chinatown" of San Francisco, which is Clement St in the Richmond District. In the late years of Aunt Mary's life, when she was not so mobile, the Hong Kong Lounge was her dim sum place of choice. The following are photos of some of the 10 courses we had for dinner at the Hong Kong Lounge. The only problem is that my little photos did not do the this grand banquet justice. Course 1 started with octopus, char siu (real red pork), roasted pork and jelly fish. I took a bite of each one, and really was trying to pace myself as there were 10 courses to this meal. I made note of the both pork offerings because I really like both of these types of pork, if made correctly. These both were made correctly. The char siu was a little charry, with a tang and nice Chinese BBQ flavor. The roasted pork had a nice crunchy top with a moist meat layer. This is very hard to do when you want to crisp up one side, which means a lot of time with heat, which means the meat could dry out. This one was not dry. The crab ball was the size of a baseball. I guess it is the San Francisco Chineses' answer to a crab cake. 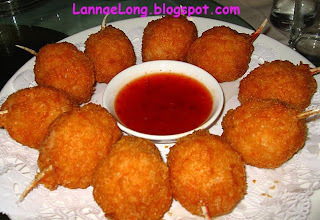 The crab ball was pure crab meat inside, and served with a Thai style hot, sour and sweet sauce. Very good, but a lot of food, and it was only the 2nd course. 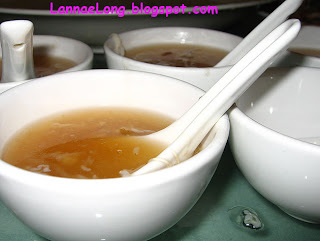 Shark fin soup is a luxury, extremely expensive, and only happens at very special occasions. An average cost of one bowl of shark fin soup is about $40 in S.F. Chinatown. Offering this soup had great Chinese cultural meaning. It is a huge gesture of deep cultural respect from the hosts to the guests. The soup represents a deep cultural offering, it is like offering ones shirt off one ones back and having be the last shirt. It is an extreme high honor to receive this soup. Every sip of this soup was remembering my Aunt Mary, and honoring her life. This soup was offered to me, and I ate it all because of the deep respect to those who offered me this soup, and to the shark who's fin it was. It would have been an affront to my ancestors, Aunt Mary, the hosts of the dinner, and my family to not eat the soup. I normally do not eat shark fins, especially knowing how the fin is harvested. 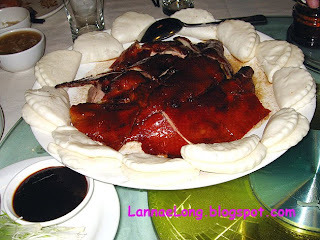 It has been years, perhaps 10 years or more since I had real Peking duck. There is a whole thing about real Chinese food where salt, bitter, sweet, sour, umami, texture and fat are all considered to make a dish. 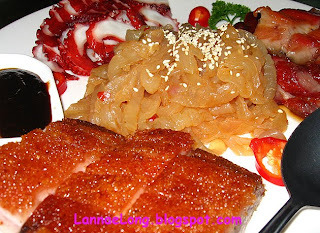 Real Peking duck takes into account texture, fat and umami. This Peking duck was served with the traditional white flour steamed buns, not crepes. The duck skin was crunchy with a fabulous duck fat layer right underneath it. To get the duck skin this way requires days of air fanning the skin, and the texture really proves that the chef did take the time make the duck right. Oh, I really went to town on this dish, as duck is one of my favorite foods, and Peking duck is my absolute favorite of the duck dishes. Abalone is another food I do not eat that often, and perhaps I have had abalone only 3 times in my life, and this is one of them. I ate a few pieces of abalone and tried to savor the flavor and texture. The texture is so smooth, with a nice al dente texture. This abalone was not fishy at all, rather it was 100% umami, making me want more. What a treat it was for me to be able to have abalone. 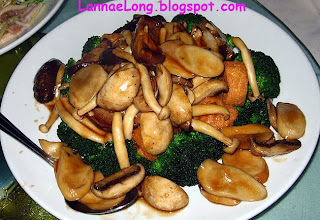 I remember my mom serving abalone once when my parents had a special guest come to the house for dinner. I did not realize who expensive it was to buy and serve. The abalone costs about $60/lb at the fresh fish market. I attempted to try and buy a can of abalone at a local Chinese grocery here in Nashville last year. They only have a few cans kept behind the counter. The one I was looking at was $90 for a net abalone weight of 8 oz. There are "abalone like" canned fish that are cheaper ($25 - $50 per can), but I can imagine it being conch or other chewy type shell fish. By this time, I was so stuffed from the 1st 5 courses, that it took all that I could do to eat a little of this dish. I was told that in a Chinese banquet and eating at a Chinese household, it is proper and polite to eat at least one bite of each dish offered. 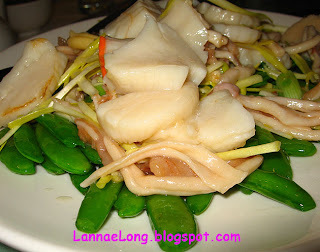 For Aunt Mary, I did eat one bite each of scallop, squid and sugar snap peas. They were delicious, and I was stuffed. 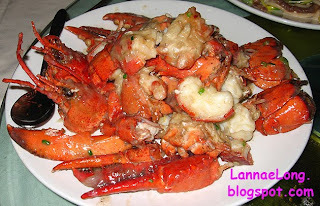 The lobster was made with the Chinese traditional flavors of soy sauce, scallion, garlic and ginger. I really love lobster, but I only ate one piece at this point because I was really stuffed! I was sitting next to my cousin and her kids, and she made the mistake of letting her kids have a french fry snack in the afternoon, and her kids were not hungry when they arrived. Her kids are really excellent eaters, they like duck, lobster, snails, scallops, etc. You name the protein, the kids have tried it and in general, liked it. It made me chuckle to hear her kids say, "Oh mom! Look! It is lobster! I love lobster! Oh, I am so stuffed, and can't eat it! I wish I didn't eat those fries!" Well, at this point in the banquet, it would not have mattered because I was stuffed, and I had taken 6+ mile walk over the hills of San Francisco with no fries before dinner, and I was stuffed. At this point, watching a huge fish come to our table, I was afraid. I lost count and needed to just take one bite of this fish and hope the end of the banquet food was near. This fish dish was served traditionally with the head and tail intact. The fish preparation is one that I grew up with and really like a lot. 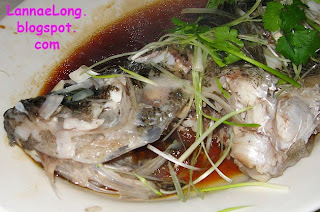 The fish was steamed with the classic Chinese flavors of soy sauce, toasted sesame oil, scallions, garlic, ginger and cilantro (aka Chinese parsley). The fish texture is so smooth, and melts in your mouth when prepared this way. The strong toasted sesame, garlic, ginger, scallion and cilantro flavors just are happiness in my mouth and nose. The aroma and flavor I adore. I don't make this preparation much because I don't have steam vessel big enough, and it seems that most people I know in Nashville are not used to the steamed fish texture and don't care for it. I did not get a photo of Course 9 - sticky rice with char siu, egg and vegetables. I literally had one bite, and everyone else at my table did the same. I love sticky rice, but I just could not eat more than one bite. The Chinese don't really do dessert besides fruit in most occasions. That is probably why I am not a dessert kind of gal. I was not raised eating desserts, I really don't like cake, I usually don't like pies, and I can't stand icky sweet desserts. In the past few years, Chinese banquets I have been to have ending the meals with a red bean dessert soup. I am guessing that it is served because red is a lucky color, and symbolizes the blood of life. 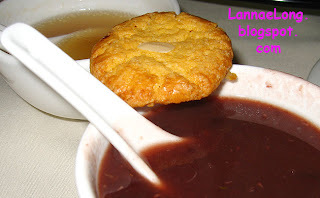 When I was a kid, I remember being served a bowl of this red bean soup, and never touching it. I am sure it made my mom mad because I was not being polite about eating at least one bite of every dish offered to me. The 1st time I really actually ate any red bean soup was about 5 years ago to be polite and do the right thing at a Chinese Banquet. I really did not care for the sugary water and red beans then, but over the years, I have learned to not dislike it. This time, for Aunt Mary, I ate a few bites, and I can't say I liked it, but I certainly did not dislike it. I was in San Francisco for a memorial of a very special Great Aunt of mine, who was 99 and 11 months old when she passed. In the Chinese lunar calendar, she was already over 100 years old. Back in the day and in the deep south, she helped lots of kids from the Mississippi delta get a high school and college education. Then she and her husband moved to San Francisco in hopes of better life outside the Delta. She walked everywhere, she cooked a lot, didn't eat much processed food, smiled and laughed a lot, and loved hangout with the kids and grandkids and great grandkids. Her home was the the place where family wanted to gather. She always offered her extra bed or couch to any of us who happened to stray into her fine city. She always had some homemade treat or meal ready for anyone who stopped by to say hello. At the memorial, we all remembered Aunt Mary with such joy and love for her. I am so lucky to have been a part of her life, I will miss you Aunt Mary. During the long weekend, I did get to go looking around S.F. a little bit, and here are some of the things I saw. While I was in S.F. CA, I missed my friends' luau party. This luau party, I heard, was worthy of the Moai. 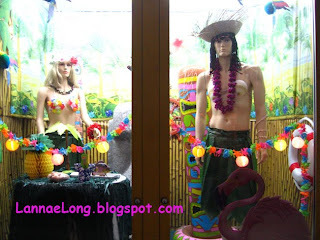 But, just at the time the luau was starting in TN, I walked by this window scape in S.F. I had to take a photo. Here's my friends and their luau! S.F. CA is known for fairly liberal politics and equal rights for all. 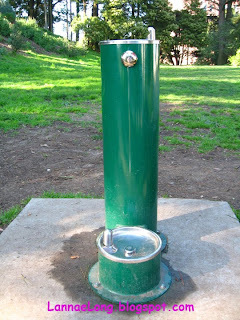 Note this water fountain, there is one for humans, and water fountain for the pets who walk with humans. Ah, equal rights for hydration for dogs and other pets that can walk with a leash. 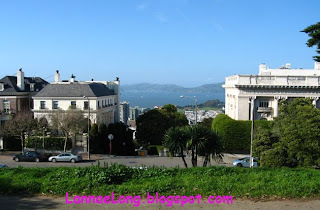 Lafayette Park is located at the very top of Pacific Heights in S.F. Look at this amazing view from the very top of Pacific Heights. It was so beautiful to see the bay. I walked up the hill to take this photo, and walked down the hill back to my hotel. The hill was really really steep. It was kind of scary to walk up and down the hill. There are no hills this steep in Nashville. 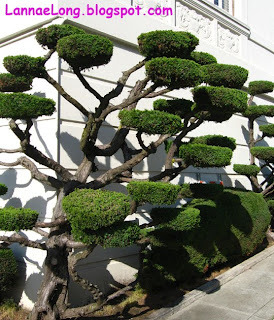 I just thought this giant bonsai was really cool looking. It is nice that the condo/apt building took advantage of a tiny strip of soil and planted shrubs in it. Where to eat in Montgomery AL? Is there anywhere good and delicious to eat at near Coliseum and Northern Blvd in Montgomery AL? Is there any restaurant near that intersection with local organic food? 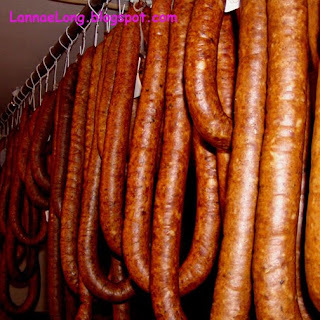 We have attempted to make dried sausage this year for the 1st time. I hope it comes out, but we will not know until 6 weeks when the sausage should be air dried and cured. What I do for a living is work in the environmental biz. When I take soil samples, I don't want to cross contaminate the soil with other stuff because I want to know what is in that soil. Also, I follow a really strict protocol for working "clean", so I don't take home any soil, especially if it is contaminated with a hazardous material. I try to do the same when making wine and now dried sausage. I try to work clean, so I don't cross contaminate my wine or sausage. So, according to Michael Ruhlman's book Ratio, 2009, the sausage ratio is 3 parts lean to 1 part fat by weight. It may look like a lot of fat, but that is ratio that seems universal. 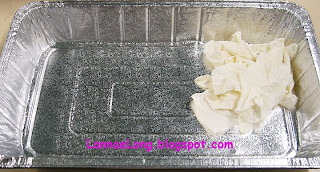 We also used pink curing salt #2 to kill the bacteria that is not good for our guts and health. It is a fact that bacteria will breed in meats hanging in ambient air and temperature, so the curing salt #2 is a nitrite/nitrate mix to keep bad bacteria from breeding. There is a "natural" alternative of nitrite/nitrate, but I don't know what it is right now. When I have time, I will investigate this alternative more. We used some red wine, Spanish smoked paprika, sweet paprika, sharp paprika, red pepper, cumin, fennel seed, black pepper corns, and garlic powder to make our sausage. We used a lot of spices. 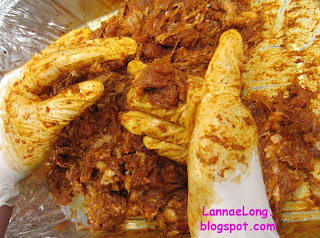 We kept on pouring and pouring and pouring spices in, taking a little bit and frying it up and tasting it. I don't know how much we used because I did not measure. Later, we asked Tandy how much oregano he use for his oregano dried sausage he serves at City House. He said he uses about 5 oz of dried and about 1 oz of fresh oregano for 100 lbs of meat/fat. Taking a look at the the typical spice rack jar, it is about 0.2 to 0.3 oz of dried herb. That means Tandy would use about 16 - 25 jars of dried oregano for 100 lbs of meat/fat. 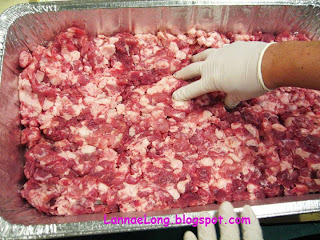 After we mixed the meat/fat with the salt cure #2 and the spices, we forced the mix into a sheep casing. And now, all of the sausage is hanging in a garage drying. We are waiting, and waiting and waiting for about 2 months to see what we get. I wasn't sure if TN was a good place to make dried sausage. When we talked to Tandy about his dried sausage, he made us feel better about making dried meats in middle TN. He said that he thinks mid-TN is a perfect place to make dried meats like parts of France and parts of Italy. He pointed out that country ham is made and hung to dry here in mid-TN, so the atmosphere, air and temperature has to be good for drying sausage. He also said that the late winter, early spring time was the best time too. OK, I trust Tandy. I am ready for spring and summer. I am ready to do things that require spring and summer weather. I am ready to jog outside. I am ready to eat outside. I am ready for another Ocoee trip. Spring, where are you? Spring, please come soon!